Hei, herkkä tagi tähän päivään! "Lapsella vain voi silmät niin loistaa, lintuja kun hän katsella saa..."
Anteeksi jos nyt aiheutin korvamadon, alla on linkit lauluun, jollet muista miten se meni! Kuva on Hilkalta ja tehty ystävänpäivänä. Tausta tehty Distress Stain hopealla; Mementon turkoosilla ja suihkeilla, kuvan reunat embossattu. Maski Dylusions ja pitsileima i brake for stamps'in. Kyllä on aivan upee ja jotekin hyvin herkkä. Kyllä on taas aivan upee ja herkkä. First I read about dylusions on Brenda's blog now on yours. I have no idea what that is and will need to look it up. 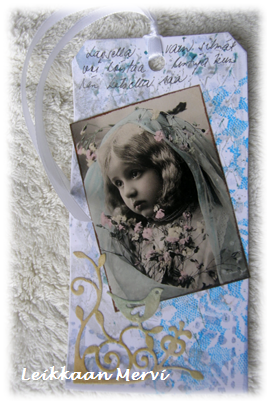 Love your creation Mervi, beautiful image and the background of the tag looks fabulous! OMGosh your tag is so fabulous. Thanks for playing with us over at Loves Rubberstamps!!! Love this tag to bits Mervi. The background is beautiful. This is beautiful! Love that image it is super sweet and the soft wintery colors are perfect! Thank you so much for playing along with us at Loves Rubberstamps this week! A beautiful tag Mervi, your background is beautiful and your corner is stunning - a gorgeous image!! and thanks for joining with Everybody Art Challenge.